Gen. V.K. Singh with Consul General Dr Swati Kulkarni, invited guests and board members of NIACC. Photos by Suresh K. Volam, Sri Photos. 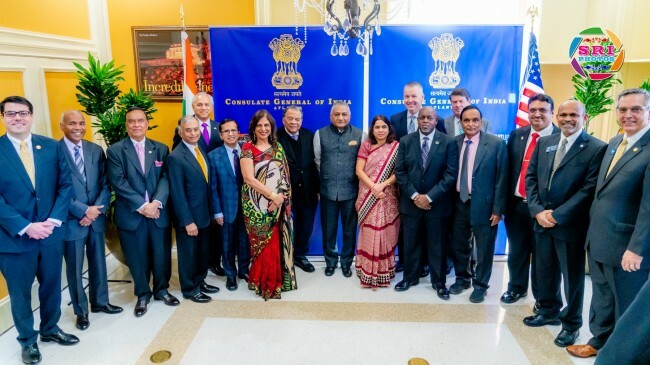 Atlanta, GA, December 6, 2018: Thanksgiving Sunday notwithstanding, the premises of the office of the Consulate General of India, Atlanta buzzed with activity on November 25, 2018 as dignitaries and prominent leaders of the city braved the cold weather to be part of two landmark inaugurations, the Passport Seva Project and South East Regional Chapter of National Indian American Chamber of Commerce (NIACC) by India’s Minister of State for External Affairs Gen. V.K. Singh (Retd.) Guests included Congressman Rob Woodall, Ambassador Andrew Young, State Senator Sheikh Rahman, Mike Glanton, Chuck Etstration, Brad Raffensperger and Mayor Rusty Paul amongst others. The chief guest, along with Consul General Dr. Swati Kulkarni and dignitaries, kicked off the inauguration with the traditional lighting of the lamp. Consul Shailesh Lakhtakia, Head of Chancery anchored the proceedings. “It is most heartening to see such luminaries taking part in these activities” said Gen. Singh addressing the guests. Passport Seva Project (PSP) is part of the flagship Global Passport Seva Program, launched by the Ministry of External Affairs (MEA) to streamline passport delivery services to Indian citizens inUnited States. The undertaking, first inaugurated outside India at the High Commission of India in London on 24 October 2018, will be implemented in the country’s embassies and consulates worldwide in the next few months. 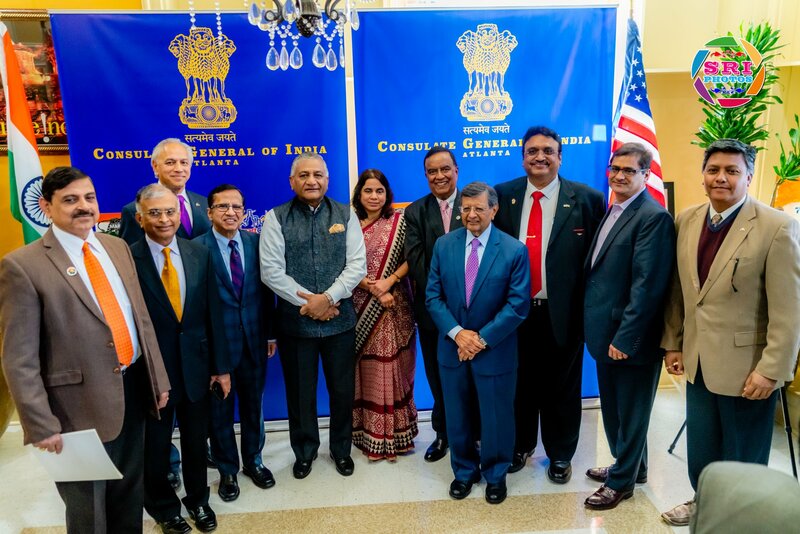 Singh inaugurated the project at the CGI New York on November 21, and CGI Washington DC on November 24, 2018. The launches for the project at the CGIs in Houston,Chicago and San Francisco are slated in the upcoming weeks, said Gen. Singh. 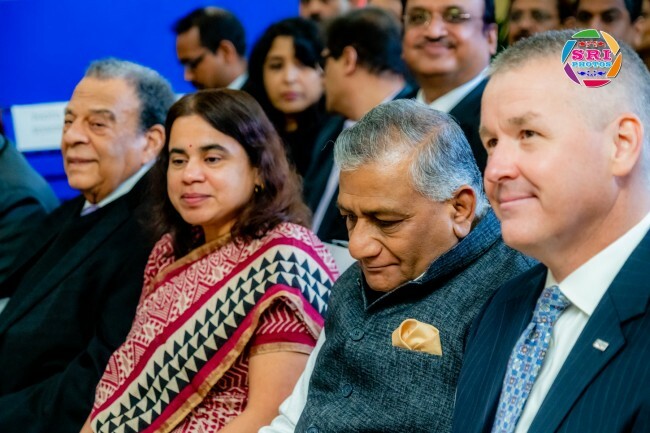 The NIACC is an umbrella organization that provides a sustainable platform and leadership forum for the governments and businesses of the US and India, to exchange ideas, interact, and promote economic development. Student friendly programs such as E-mentoring provides students role models across the country. The Youth Entrepreneurship BizFest platform provides tools to succeed in business. “Indian missions across world will soon issue a passport in less than 48 hours to the Indian diaspora,” said Gen. Singh. “The new digital overhauling will ensure easy and convenient application submission process, standardization, digital verification of major applicant information, end-to-end status tracking and enhanced security”. “Today we have 365 passport functional offices and our goal is to establish these offices in each of the 543 parliamentary constituencies,” he added. The MEA, he said, entered into an agreement with the postal department to open services on their premises to ensure that a citizen doesn’t have to travel beyond 60 kms for passport services. “In New York I was told someone got their passport within two days of application and within two weeks in DC,” said Singh, crediting improvements in procedures and timelines to digital linkages withIndia’s data center. Singh joked that people in Mumbai, where Dr. Kulkarni served earlier, get into panic mode upon receiving a text message that their passport is being dispatched soon after they reach home from the passport application. L to R: Ambassador Andrew Young, Consul General Dr Swati Kulkarni, Gen. V.K. Singh and Congressman Rob Woodall. These rules had been simplified to a large extent with the idea that the government must trust its citizens, be it simply requiring applicants to claim clean records, or birth certificates, said Singh. “We have almost 100 million passports issued this year,” the minister added, while commending their digital partner TCS who he said had done a great job integrating the project. “Today not a single village in India is without electricity,” Gen. Singh said with pride, while highlighting major milestones in the past five years which included reduced cost LED bulbs, provision of cooking gas to 700 million people and financial inclusion of people who were never in the banking system, allowing zero balance accounts and channeling government aided funds through the banking system. “The partnership between oldest and largest democracy is always welcome,” said Gen. Singh, emphasizing on mutually beneficial investment opportunities in Indi ain healthcare, infrastructure, environment sectors among others. “You are the foremost country that has the technology and therefore we look forward to your friendship, partnership to leverage this great strength US has in entrepreneurship, experimentation, technology and innovative spirit,” he said. Congressman Rob Woodall, in his brief address, asked the gathering to spread the word that Atlanta, Georgia and other Southeastern states are open for business. “The group you see right here embody the entrepreneurial, innovative spirit. This is a room full of difference makers. This is a community that does not take no for an answer, steps up and gets things done in partnership with one another,” he said. Ambassador Young spoke about India’s legacy of non-violence. Speaking of the historic connection withIndia, Young said Dr. Benjamin Mays from Moreshouse college was one of the attendees ofIndia’s independence in 1947 when presidents of historically black colleges were invited. “When Dr. Mays came back and spoke enthusiastically about what had happened in India, it woke us all up,” he said. 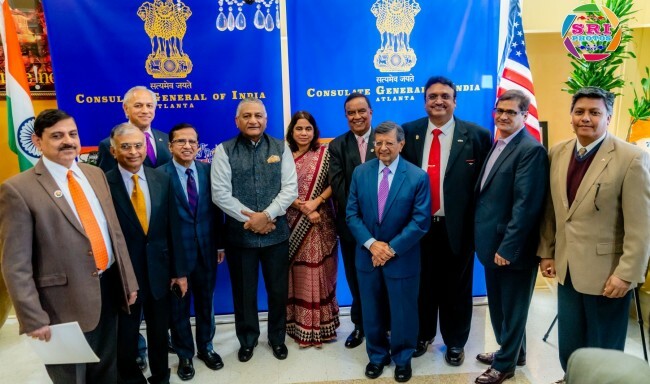 Young commended Indian-Americans, citing Gaurav Kumar who was selected one of Atlanta Business Chronicle’s 40 Under Forty honorees for 2018. Gen. V.K. Singh with Consul General Dr Swati Kulkarni and board members of NIACC. KV Kumar, NIACC National Chairman introduced the chamber’s local and national team. Executive Board & Officers includes KV Kumar, National Chairman, Mukesh Aghi, National Vice Chairman, Appen Menon, National President, Glenn Falcao, National Secretary and Komal Kaul, National Executive Director. The NIACC Atlanta SE Region Chapter team includes C.N. (Madhu) Madhusudan, Atlanta SE Region Chairman; Ritesh (Rick) Desai, Atlanta SE Region Vice-Chairman; Narendra Shah, Atlanta SE Region Co-Chair & President; Brenda Morant, Special Assistant to the National Chairman & Atlanta SE Region Co-Chair; Rudy Beserra, Atlanta SE Region Co-Chair; Niraj (Nick) Sheth, Atlanta SE Region Co-Chair; Viren Mayani, Atlanta SE Region Co-Chair; Madhu Sheth, Atlanta SE Region 1st Vice-Chair; SuBrena Graham, Atlanta SE Region 2nd Vice-Chair; Vasudev Patel, Atlanta SE Region Director; Milton Chambliss, Atlanta SE Region Director; Prathap Singh, Atlanta SE Region Director & Regional Office Liaison to Karnataka State; Dr. Jagdish (Jag) Sheth, Atlanta SE Region Advisory Board Member , Dr. Girish Panicker, Atlanta SE Region Advisory Board Member.